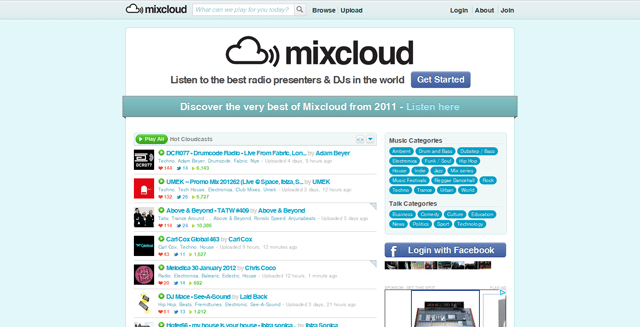 DJ Toolbox: Finding New Music Online, 2012 Edition! You’ve got all the gear you need to tear up the club, and you’ve mastered every transition tutorial you’ve found online- but here’s a dirty little secret: No matter how fresh your gear is, it’s useless if you don’t have great music to play. In today’s toolbox, Meatman takes some time to share his process of crate digging in the digital DJ realm of the internet. We’ve written about this previously, so enjoy this update for 2012! Discogs is arguably the most important tool for any musician or music lover seeking to explore new music. It’s a comprehensive library of practically any song, album or label you can think of all built by its vibrant, music-loving community.For DJs it’s particularly useful for understanding the relationship that labels, artists and releases have with each other. I was listening to a dubstep mix on BBC Radio One several years back. About 20 minutes in I heard a track I really liked. I looked the mix up, found a track listing, and after cross-referencing some tracks on YouTube, I finally found this magical track. It was called “The Goat Stare” by a producer named Loefah. 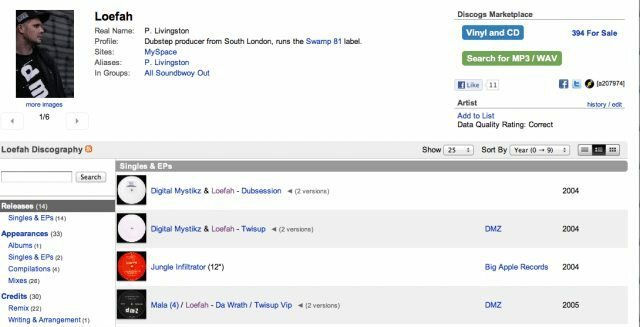 I immediately went to Discogs and searched for it – it turns out that track was on the the sixth release from a UK-based label called DMZ (or DMZ 006). I also found out that Loefah released this track with another track, called “Root“, giving me perspective about the release in context. I also checked out Loefah’s artist page, which chronologically organizes every single one of his releases across a span of labels. Even further, Discogs has a feature that allows users to create lists of their favorite artists and releases. I happened to find this gem from DMZ 006’s page too, leading me to almost 100 more tracks to check out. Just from that one single track, I was able to find not only the track that it was released with, but the label, related artists, and relevant releases. This gave me access to more than 100 quality tracks that made me excited to play out. The best DJs don’t play arbitrary tracks at the same BPM, there’s a meaning and a flow to their sets and with a tool like Discogs, you can understand what tracks can flow together and why. A plan like this will help you give your mixes a deeper, smarter edge and is well worth the extra effort if done right. TL;DR: You’re a music detective. Discogs is full of incredible clues. If you don’t use it when scouring for music, you’re actually missing out. Last.fm, the unofficial encyclopedia of music: it’s a great tool for exploring new music and even stumbling upon new genres that you may have never heard of. Type in practically any artist, for any genre of music, and you’ll be rewarded with a wiki-style entry for the artist or band. Some have more info than others and it’s common courtesy to add or modify information about artists that you know about. Probably the coolest part about Last.FM is their free on-demand radio station. Similar to Pandora, Last.fm radio allows you to search an artist, genre, or keyword, and generate a practically endless spring of music based on your keywords. I really suggest you try it. Actually, go right now. Type in an artist or genre, and come back here. You can keep pressing next for other related tracks, or if you’d like, you can sign up for a Last.fm account and flag the tracks you dig so you can check them out later. Mixcloud provides you with fantastic framework for following your favorite DJ’s and producer’s mixes. You can explore mixes from practically any major DJ on the planet giving you inspiration in not only song selection, but also mix technique. Plus, looking through sets can give you a really good starting point for finding new music. Mixcloud’s users are required to include a detailed set list along with their uploaded mixes, so you wont have to worry about going on a hunt for a track you like. 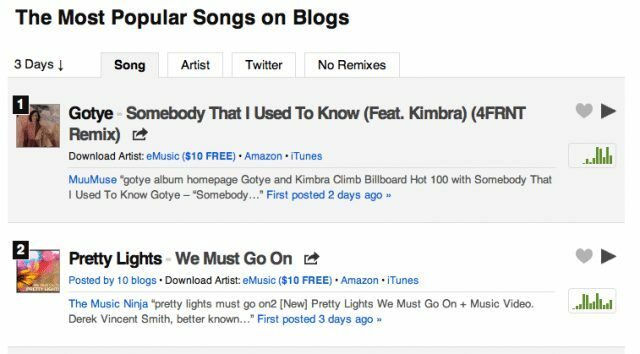 Blogs are another great way to find new music – but often times the process of finding blogs and keeping track of their new content and music posts can be exhausting, even with an RSS reader. Music blog aggregators solve this problem by collecting content from tens of thousands of blogs and allowing users to vote on new tracks that they love, and Hype Machine has been the king of this process for about four years now. Be sure to check out the “top” lists once every few days, especially if you’re looking for great new remixes of more popular songs. Lastly, I’ve found Wikipedia to be very helpful in my hunt for new music. Wikipedia is excellent for several reasons, and while Wikipedia’s music community isn’t as vibrant as Discogs’s, music-realted articles can be useful for understanding the historical background of genres. Understanding where the music came from, how it has evolved, and what artists were involved in building the genre is an instrumental part of finding good music. For instance, a quick search for Drum & Bass finds us at a large article discussing the history, evolution, and current state of the Drum & Bass scene. You learn about the distinguishing features of sub-genres like jungle, jump-up and liquid, and the contributions that producers like DJ Hype and Roni Size have had on the genre. Understanding these details is really, really important to keep in mind as a DJ and can help keep your set consistent and well thought out. Again, Wikipedia is not necessarily good for finding information on individual tracks, but more for understanding the complex evolution of music scenes, giving you a greater perspective of what exactly you’re playing and what you’re trying to find next. 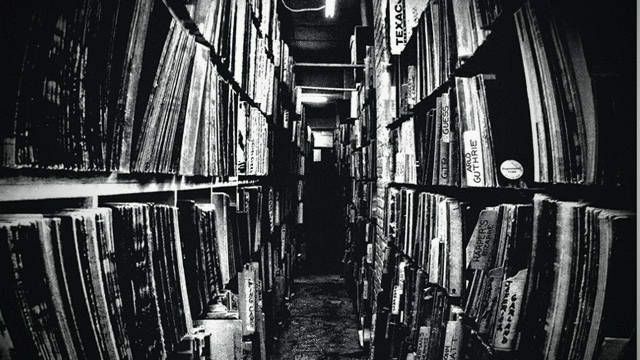 Naturally, there’s an endless list of ways to find music online – some of the places we’ve covered in the past include Beatport (not to be missed: their DJ charts), Soundcloud (as mentioned in the comments below, the amount of groups around specific genres is incredible), Spotify, YouTube, Pandora, and digital record pools. Whichever tool you use, the DJ’s individual music discovery process is the most defining characteristics of being a DJ. It can be strenuous putting in all of the track digging work needed to make good, regular DJ sets – but think of it as the homework that pays off when exam time comes around. Using the above resources, it’s crucial to take some time regularly to freshen up your library and find new artists, genres, and tracks that make you excited about playing music. What secret tools do you use when looking for what to work into your DJ sets next? Let us know below.